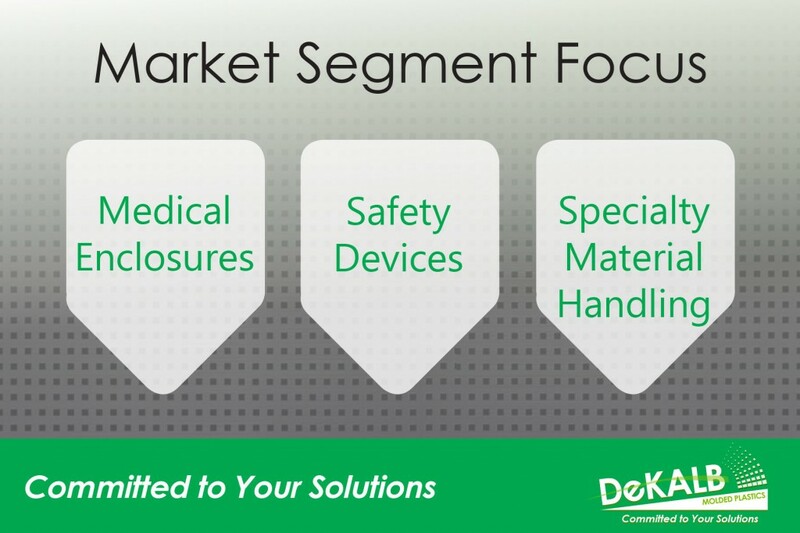 DeKALB Molded Plastics made a strategic decision in 2014 to focus on multiple market segments. Our goal is to expand our market focus to offer quality structural plastics to industries that promote better quality of life. Our main three segments are Medical Enclosures, Safety Devices, and Special Material Handling. Each brings their own unique value to DeKALB and provides the opportunity to display our capabilities in different ways. Medical Enclosures – Typically are molded with engineered resins with value added operations such as inserting, painting, silk screening, and/or kitting. Volumes may vary in quantity. This segment meets our core competencies both from a molding and finishing perspective. Safety Devices – Safety is the number one focus within DeKALB and anytime we can provide product within that industry, we consider it a win. In addition, we currently have a customer using 100% recycled material in their product. Not only are we providing a safety product but also focusing on being green. Specialty Material Handling – This segment goes well beyond pallets. Any product used to store or transfer could be placed in this market segment. The structural foam process provides product that is light weight yet durable in strength. In addition, not only are virgin materials utilized in these products but also regrinds to save on costs. Our development processes are continually improved and perfected to fit the needs of specific industries. As we continue to expand our offerings and capabilities, we have researched other market segments, such as Recreational and Lawn/Garden. DeKALB is always looking for new opportunities and strives to offer the highest quality of products and service. While we focus on our deliberate market segments, each are carefully evaluated to ensure the needs are within our capabilities and align well with DeKALB’s overall growth strategy.